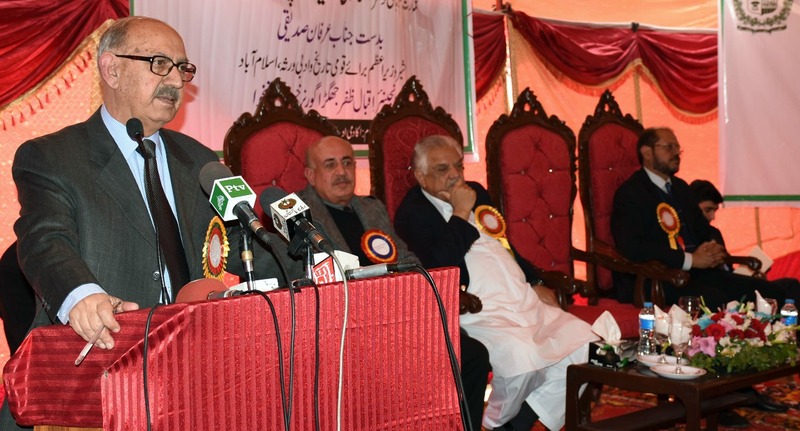 PESHAWAR: Advisor to Prime Minister on National Heritage and Lok Virsa Irfan Siddiqui has said that the promotion of art and literature is a noble cause and stressed upon the need for the proper patronage of the writers in the society. He said this while addressing foundation stone ceremony of Pakistan Academy of Letters (PAL) here on Saturday. Khyber Pakhtunkhwa (KP) Governor Iqbal Zafar Jhagra was also present on the occasion. The PAL, Siddiqui said, was established in 1976 but the institute in its 42 years period could neither do anything for its survival nor for the writers. He told the audience that Rs120 million had been approved for the construction of PAL in FATA, and added that the building of the academy would be constructed after acquiring land. “These institutes would not only serve as centres of excellence for the promotion of art and literature but would also promote knowledge. He informed that monthly stipends of the writers had been increased from Rs7,000 to Rs13,000. This stipend used to be paid to 450 writers in the country, but now it would be paid to 900 writers, Siddiqui said. He added that the number of awards in various regional languages had been increased to 20 from 11 while the amount of the insurance had also been doubled. He said that the federal government had provided Rs500 million grant to Ministry of National Heritage and Lok Virsa that enabled to support the writers. If society is like a body then writers are its soul, the advisor said. The body is useless without soul and the federal government was taking every possible step for the promotion of writers in the country, Siddiqui concluded.